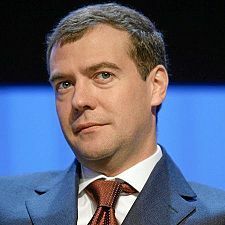 Dmitry Anatolyevich Medvedev: Do the Europeans Trust this Russian President? Global Implications of a “Summer War” in Georgia. Christ warned that signs of the end of the age would be “wars and rumors of wars” and nations rising against nations (Matthew 24:6-7). The brief “summer war” in Georgia and South Ossetia fits in well with Christ’s predictions—here we see ethnic groups in the north and south of Georgia fighting each other and the government of Russia quickly intervening in support of the break-away region. But this war is more than just a “summer war” over South Ossetia’s right to become independent. Currently, Europe relies on Russia for nearly 40% of its oil and gas. Georgia was a promising tool to bring oil and gas across southeastern Europe and into Turkey—and eventually to Austria to help offset Europe’s reliance on Russian fuel. This was while Georgia was viewed as a stable and safe nation. Russia, well aware of Georgia’s strategic fuel resources, opposed from the start a pipeline project to bring Georgian fuel to Turkey (Globe and Mail, August 18, 2008). Germany and Europe are in turmoil about how to deal with the current crisis, with many calling for “offensive” actions against Russia’s “imperial tactics” instead of just defensive (Der Spiegel, August 18, 2008). Russia’s “summer war” in Georgia will also likely further galvanize the EU—especially if the EU chooses to take unified military action on what many view as European soil. Essentially, I believe that the situation with Georgia has shown the Europeans that they must be able to stand up against the Russians and that they need a stronger military of their own in order to do this. I believe the Europeans are learning that they should not trust the Russian president. The Georgia war should make it easier for the European leaders to convince the average European that since they do need oil and that the Russians are starting to threaten them (see Russia Threatens Poland with Nuclear Attack), that a more united and militaristic Europe is needed. Of course, once they are a more significant military power, a united Europe will be strong enough to deal with others (including those that they currently do not see as direct enemies, see Isaiah 10:5-7). And that will affect the rest of the world. This entry was posted on Sunday, August 24th, 2008 at 6:46 am	and is filed under COG News, Prophecy.